Our Verdict: Cheap looking and fragile, the Sonic Vaporizer has a boxy design (like some of the most popular box mods) that may appeal to some, but not all. Vapor quality is, at its best, horrid. With a plastic-like aftertaste, irritating throat hit, and not so pleasant warm vape, this is a device that’s definitely not worth it, even if it were to cost half its asking price. Design: The Sonic Vaporizer comes in a boxy shape that may or may not appeal to users. While there are boxy vaporizers that succeed in looking classy (such as the DaVinci Vaporizer), this looks a bit tacky. This is especially true with the silver frame around it and the loud colors it is available in. The plastic body feels cheap too. It is not overly portable. Given the awkward shape and its thickness, users may not be able to fit it comfortably in their pockets. Overall, the device definitely does not look like it’s worth $200. Build Quality: In a weird way, the build quality of the Sonic Vaporizer is both good and bad. The body is made almost entirely out of plastic and seems to be machined well with everything fitting together perfectly. The buttons are responsive and details look well-made. A strange plastic smell emanates from the herb chamber, which makes it seem cheap and low-quality, despite the precision machining. Also, even with the well-fitting parts, the device feels like it would fall apart with just a small bump. 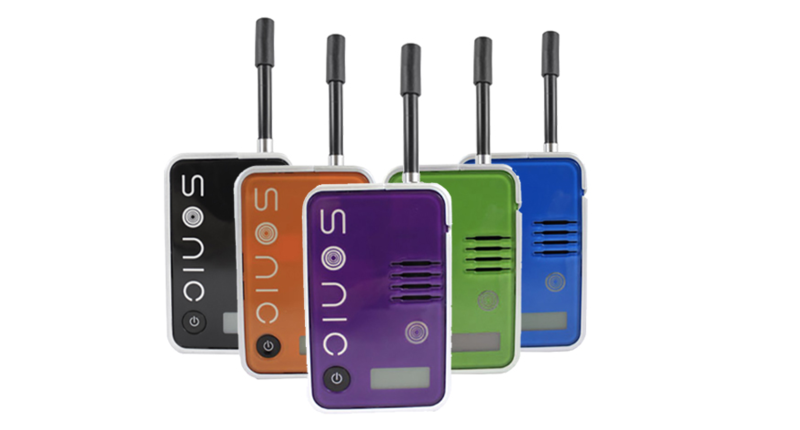 What’s in the Box: With every purchase of the Sonic Vaporizer, users get one Sonic Vaporizer itself, one mouthpiece, one wall charger, one cleaning tool, three replacement screens, and one instruction manual. Usability: The Sonic Vaporizer is very easy to operate. Turning it on requires a simple flick of a switch. Once on, users set the temperature (just like in TC mod) and press the power button to activate the heating chamber. Take note that the power button itself does not turn the device on and this looks like a design flaw, but nevertheless, it is still simple enough to figure out. There is also a digital display that displays which temperature is set; this allows users to know how hot their herbs are going to be. Filling the chamber is not as easy, because it is very small. Using small funnels can make it easier. Alternatively, if a small funnel is not available to you, use a piece of paper or calling card as a makeshift funnel to ensure the herb is not spilled during filling. The chamber is then secured with a strong magnetic cover that won’t come loose without some degree of force. Vapor Production and Performance: If a device has poor build quality, but superb vapor production and performance, it might be worth it. With the Sonic Vaporizer, this is not the case. Build quality is poor, but its vapor production is even worse. First, the vapor is a bit warm for most tastes. This is because the heating chamber is placed too close to the mouthpiece. Also, the stainless steel borders and the silicone mouthpiece don’t help in cooling the vapor before it reaches the user’s lips. Second, and most importantly, the taste of the vapor is terrible. It was mentioned that the heating chamber has a plastic smell and this smell translates to a plastic taste when used. The plastic taste is strong enough to overpower the herb’s natural taste, which is not something users would want a vaporizer to do. Further damaging the overall performance of the device is the weak vapor production. For example, if a user has a preferred temperature setting, it may be too weak, thus causing the user to have to fiddle with it to adjust it properly again. It seems the device’s internal thermometer is not accurate, so some compensation is required. Battery Life and Atomizers: Battery life of the device is average for its size. Fully charged, it is capable of about five vaping sessions. Of course, this depends on the temperature set and how many users are toking on the device. Recharge times, on the other hand, take about three to four hours, which is pretty much standard for a unit this size. The heating chamber is made of ceramic and while vaporizers with ceramic chambers usually produce clean tasting vapor, this is wasted on the Sonic Vaporizer, because of the plastic smell that emanates from it. The chamber does heat up pretty fast; about 30 to 45 seconds, depending on the temperature. It may seem that the Sonic Vaporizer does not have much going for it. Despite having an efficient ceramic heating chamber and an easy to use interface, the vapor production and overall build quality ruins it all. To be fair, the device reviewed may have been a fluke and other samples may not have the same plastic smell and taste. The overall build quality and warm vapor can’t be changed and that’s still a negative. If this is the case and users find a unit that does not have the plastic smell and taste, the Sonic Vaporizer is a decent performer. Vapor production is not as good as other devices and the temperature control may not be totally accurate, but it is efficient and very easy to use. For the price, $199.99, the device is not worth it. There are many other, more capable vaporizers that cost less, have superior build quality, and great vapor production. Even if the plastic smell and taste is taken away, the Sonic Vaporizer is still overpriced for what it is. Designed and crafted in the USA, the Elevape Smart Vaporizer is making waves in the industry. Read on to find out why.